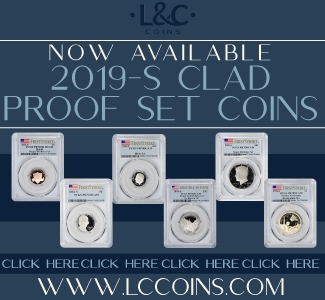 The United States Mint will open sales for the 2019 Apollo 11 50th Anniversary Commemorative Coin Program on January 24 at noon EST. 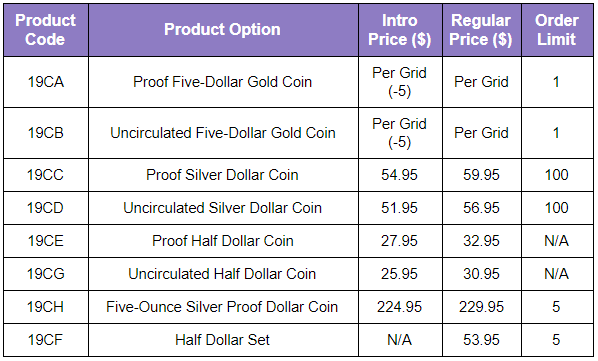 This unique four-coin program includes the Mint’s first reeded five-ounce proof silver dollar, a $5 gold coin, a silver dollar, and a half dollar. All coins are curved. 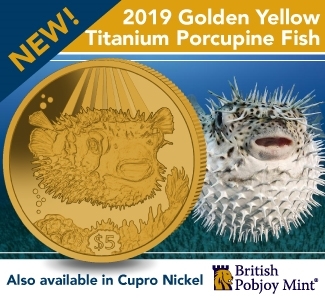 This year, the Mint increased the silver content of its commemorative standard silver dollars to 99.9 percent silver. 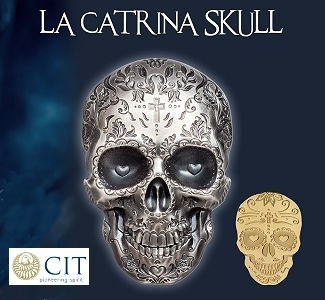 In the past, these coins were 90/10 silver–90 percent silver and 10 percent copper. Product options, pricing, and order limits are below. Gary Cooper of Belfast, Maine created the obverse design that appears on all coins in this program. Cooper’s design features the inscriptions “MERCURY,” “GEMINI,” and “APOLLO”–separated by phases of the Moon–and a boot print on the lunar surface. The design represents the efforts of the United States space program leading up to the first manned Moon landing. Additional inscriptions are “2019,” “IN GOD WE TRUST,” and “LIBERTY.” Mint Sculptor-Engraver Joseph Menna sculpted the design. 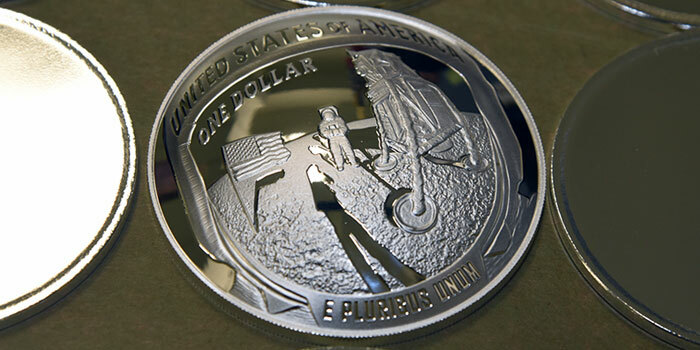 The coins’ reverse design features a representation of a close-up of the iconic “Buzz Aldrin on the Moon” photograph taken July 20, 1969, showing just the visor and part of the helmet of astronaut Buzz Aldrin. The reflection depicted in Aldrin’s helmet includes astronaut Neil Armstrong, the United States flag, and the lunar lander. 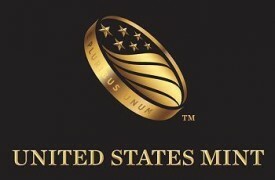 Inscriptions are “UNITED STATES OF AMERICA,” the respective denomination, and “E PLURIBUS UNUM.” Mint Sculptor-Engraver Phebe Hemphill created and sculpted the reverse design. 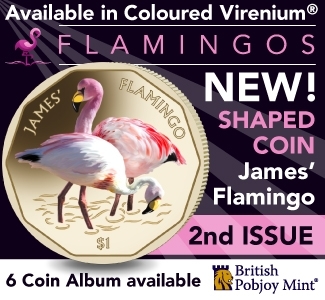 The Mint accepts orders at www.catalog.usmint.gov and at 1-800-USA-MINT (872-6468). Hearing- and speech-impaired customers with TTY equipment may order at 1-888-321-MINT. 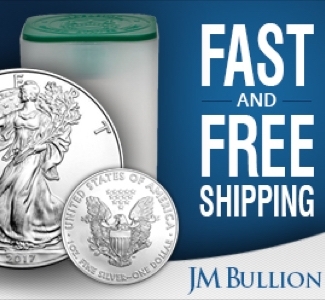 Visit www.catalog.usmint.gov/customerservice/shipping.html for information about shipping options.